Review: Did you ever think that your entire family would live together in one house? Don't you think it would be a little crowded with all your aunts, uncles, cousins, and grandparents? Well in the book Hooray for Anna Hibiscus! by Atinuke, Anna lives with her entire family in one house in Africa. Anna Hibiscus does many interesting things. Something really bad that she does is that she does not let the Saturday weaving aunties weave her hair. She hides so that nobody will see her. Over the week her hair becomes really messy. That Thursday her teacher tells her to go back home because her hair is so messy. Her hair became so tangled that on Friday she has to let her grandmother comb out her hair. Even when her grandmother pulls at her hair she does not complain. Then her grandmother has to cut it. On Saturday she lets the Saturday weaving aunties do her hair so that it does not get messy again. She also goes to see the other side of the city. This is the poor side of the city. She sees all of the poor children without any clothes. She feels sad that they don't have everything she has, so she gives them the clothes that she is wearing, the bows that she has on, and her shoes. These are just a few of the interesting things that Anna Hibiscus does. My favorite thing about this book is that it is very funny. Anna and her family are very interesting and sometimes funny as well. They are always doing something interesting. Anna's family makes the book fun and interesting to read. Hooray for Anna Hibiscus! is very interesting. If I had to rate this book my rating would be 3.5 out of 5. It is a very short and easy book, but it is still very interesting. However, if there was one main topic the story would have been more interesting. I loved this book. It is a great book for young readers. Review written by Yahvi (5th grade student). We would like to thank Raab Associates, Inc. for providing a copy of Horray for Anna Hibiscus! for this review. 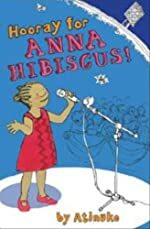 Have you read Horray for Anna Hibiscus!? How would you rate it?